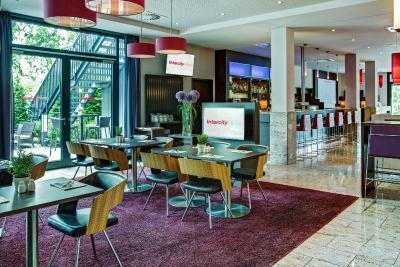 Lock in a great price for IntercityHotel Berlin Brandenburg Airport – rated 8.7 by recent guests! 5 mins walk from the airport. Free transportation ticket was super helpful. It takes 40 mins to get to the city. Clean spacious room. 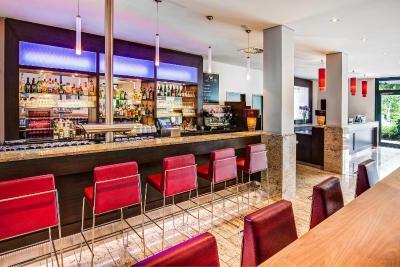 Close to the airport, nice staff, clean, modern, good restaurant. I like everything but the most I liked it was definitely the breakfasts and the public transportation ticket included with the room price. Great location for early flight. Easy walk to train station and airport. Good restaurant so don’t have to go find another one once at airport area. Great breakfast and coffee. Close to Schonefeld airport. Nice view of the airport. The room was super clean. Excellent location, professional staff, perfect new interior. Very clean, literally right next to the airport and amazing breakfast buffet. Very good wake up call- sounded more as a fire alarm. Had a nice stay stay with friendly staff. very well located. So close you can walk to the airport. Great location for access. Clean and comfortable. 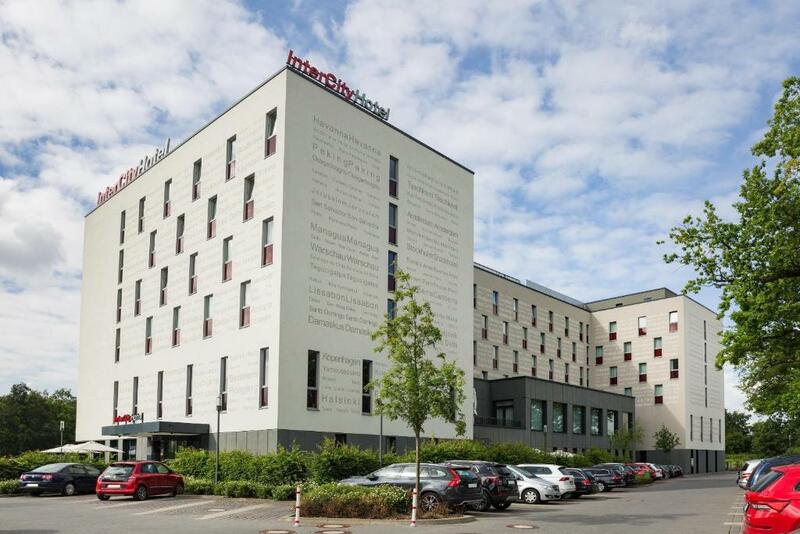 IntercityHotel Berlin Brandenburg Airport This rating is a reflection of how the property compares to the industry standard when it comes to price, facilities and services available. It's based on a self-evaluation by the property. Use this rating to help choose your stay! One of our best sellers in Schönefeld! 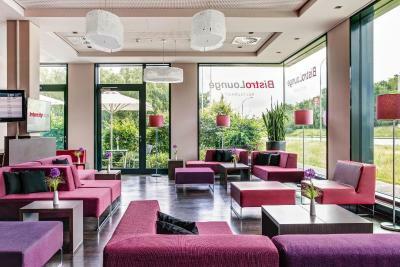 Just 1,300 feet from Berlin Schönefeld Airport and Train Station, this hotel offers soundproofed rooms with flat-screen TV. 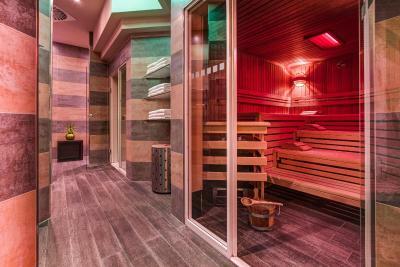 The spa and gym can be used for a daily charge, and guests enjoy free use of public transport. The IntercityHotel Berlin Brandenburg Airport newly opened in March 2010. 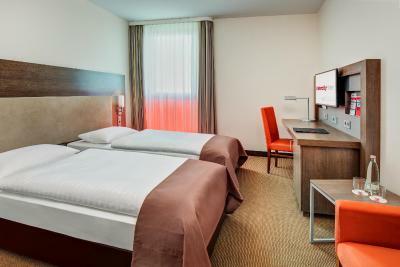 It has spacious rooms with air conditioning, mini-bar, and a laptop safe. Free WiFi is available. 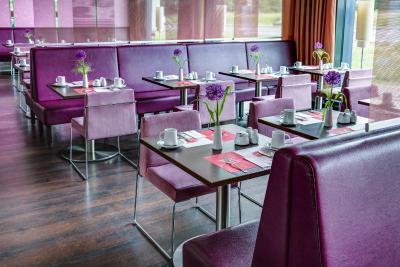 Brandenburg dishes and international specialties are served in the IntercityHotel's restaurant. 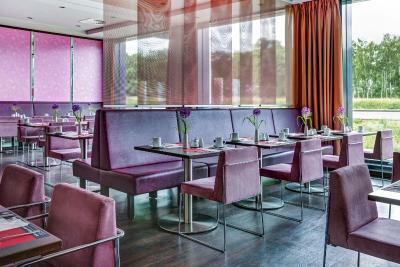 The bistro, lounge bar, and summer terrace invite guests to relax with a drink. 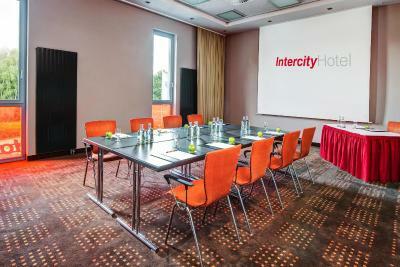 IntercityHotel Berlin Brandenburg Airport is a 2-minute drive from the A113 motorway. 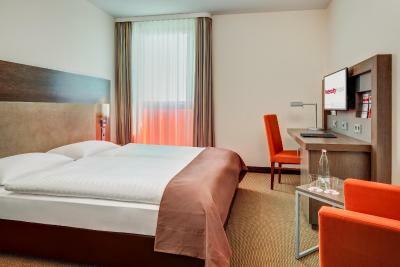 The famous Alexanderplatz Square is only 20 minutes away by regional train. 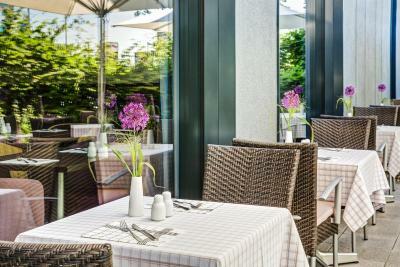 This property also has one of the top-rated locations in Schönefeld! Guests are happier about it compared to other properties in the area. 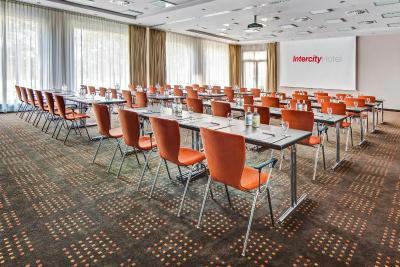 When would you like to stay at IntercityHotel Berlin Brandenburg Airport? 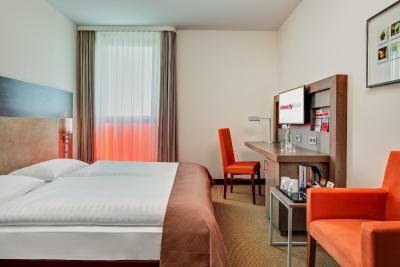 Bright, modern and air-conditioned room on the lower floors with a flat-screen satellite TV and Sky channels free of charge. WiFi up to 1 Mbit/s is included. The bathroom is equipped with a shower, a toilet, a hairdryer and a cosmetic mirror. 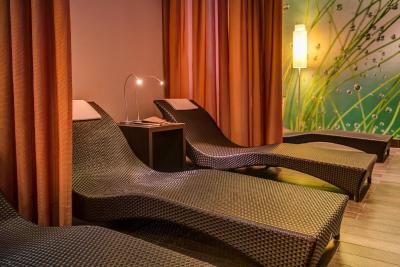 Please note there is an extra charge of EUR 10 per person per day if you want to use the spa area. 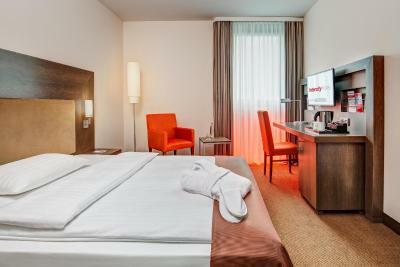 Bright, modern and air-conditioned room on the third and fourth floor with a flat-screen satellite TV and Sky channels free of charge. WiFi up to 4 Mbit/s is included. 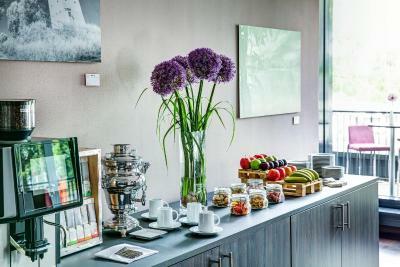 Guests can enjoy complimentary coffee and tea making facilities. The bathroom is equipped with a shower, a toilet, a hairdryer and a cosmetic mirror. 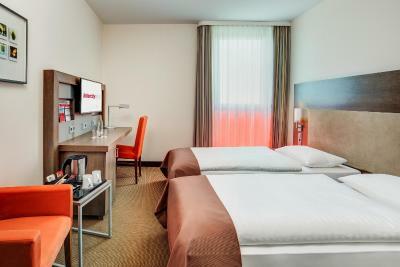 Bright, modern and air-conditioned room on the lower floors with a flat-screen satellite TV and Sky channels free of charge. WiFi is included. The bathroom is equipped with a shower, a toilet, a hairdryer and a cosmetic mirror. 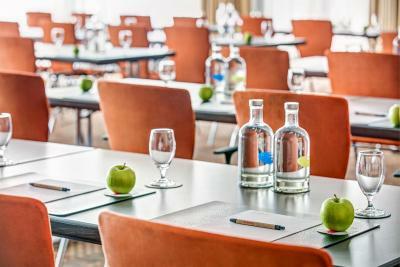 Bright, modern and air-conditioned room on the fifth floor, overlooking the airport, with a flat-screen satellite TV and Sky channels free of charge. WiFi up to 4 Mbit/s is included. 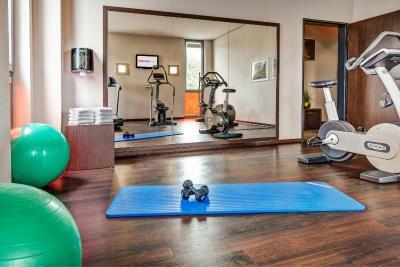 Guests can enjoy complimentary coffee and tea making facilities, as well as free access to the gym and a free bathrobe. The bathroom is equipped with a shower, a toilet, a hairdryer and a cosmetic mirror. A late check-out until 14:00 is already included. 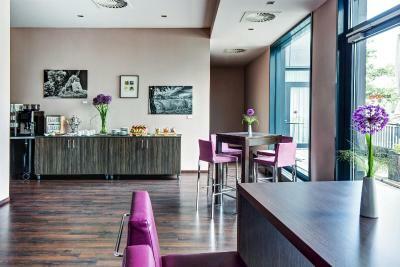 House Rules IntercityHotel Berlin Brandenburg Airport takes special requests – add in the next step! 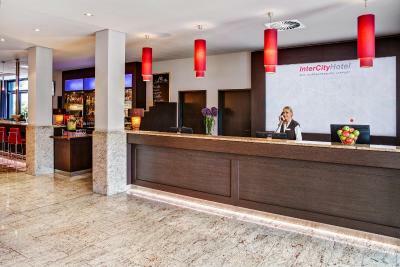 IntercityHotel Berlin Brandenburg Airport accepts these cards and reserves the right to temporarily hold an amount prior to arrival. Please note that the WiFi is free up to 1 Mbit/s. Please note, private parking is limited and can not be guaranteed. Public parking is possible off site (reservation is not possible) and costs EUR 15 per day. 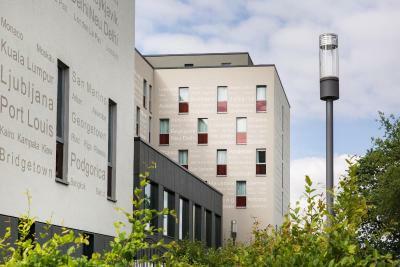 Please note there is an extra charge of EUR 15 per person per day if you want to use the spa area. High prices at the restaurant and the food was very poor. There's no short-term parking for guests that want to drop off their suitcases before parking their car. Very conveniently located when you need to be at Schönefeld quickly. Clean rooms with everything you need. 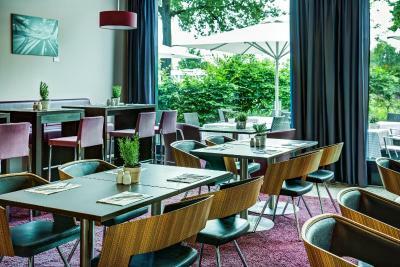 Great location if you arrive at Schönefeld. Price-wise it's quite interesting. Good facilities. 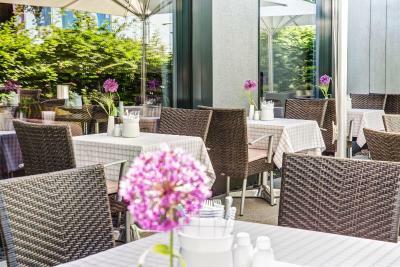 Five minutes walk from Schonefeld! Great location, right by the airport. Very clean and very modern rooms. Staff is n’either very attentive nor polite - typical “Berlin service mentality”. Closest hotel to the airport. Convenient for early morning departures. I couldn't really control the AC/Heat that well but I opened a window and it was fine! I loved the location, I got in late on Wednesday and had to leave early on Thursday so it was perfect to be able to walk from the airport to the hotel. The room was very spacious and nice! 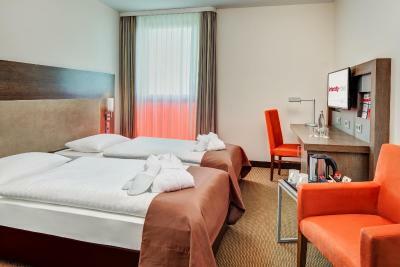 Great place for a stopover as right next door to the airport, rooms are a good size and very clean and quite! 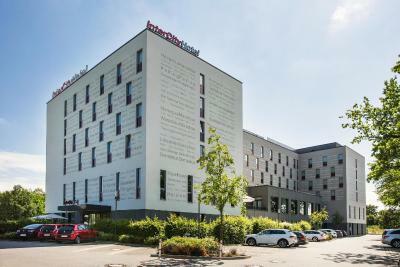 Great hotel and ideal for late arrivals! 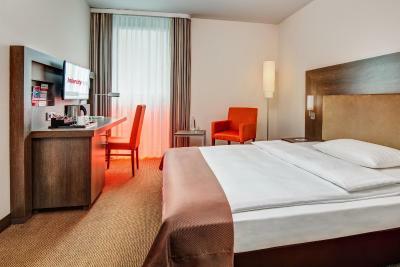 Good hotel for early flight from schönefeld airport. Only 5 min walk. Walking distance to the airport. Various hot drinks options in the room. Room is comfortable.